Art 84’s second Dance + Music + Art exhibition combines forces with Fisterra Projects for this year’s East Austin Studio Tour (EAST). New offerings at the venue on 84 Waller Street include a sculpture garden, dance parties and a video premiere. Jennifer Chenowith, founder of Fisterra, and Larry Vanston, the visionary behind Art 84, have been neighborhood friends for years as well as avid dancers. Their collaboration at this year’s Art 84 will certainly be a must-visit spot on the 2018 EAST tour. Vanston’s home, just east of downtown, will turn into an art gallery for two weekends showcasing 11 visual artists both indoor and out—working in a range of mediums from painting, drawing, photography, sculpture and video. And for the first time, Vanston and the exhibition team will temporarily transform the backyard outdoor space into a sculpture garden and live music/dance venue. 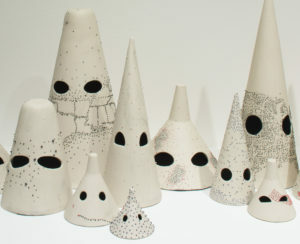 Featured 3-D artists include Amy Scofield, Valérie Chaussonnet and Emily Hoyt-Weber. Scofield is known for investigating the surprising relationships between objects as diverse as sticks, recycled plastic, tires and old high-heeled shoes. Chaussonnet, who is a painter as well, will install her latest metal sculptures that paradoxically suggest weight and buoyancy. Hoyt-Weber, a featured Austin Art in Public Places “Tempo” artist at last year’s EAST, will premiere a welded geometric sculptural installation in this outdoor setting that highlights its lyricism. The indoor space promises to excite as well, with paintings, photos and sculptures filling every room. They range from mythology and magical realism (Jose Lopez), thematic figurative work (Cornelius Carter, Melanie Hickerson), wildly colorful expressionism and abstraction (Linda Dumont, Helen Mary Vanston Marek , Alicia Philley) and lush photographs by Thierry Bignolet. To cap it all off, the artist collective Gentlemen Dancers will project their new film about the Austin two-step scene. Live music will include some of Austin’s best jazz, tango, country, contemporary and Tejano bands at the Friday evening parties, at the Saturday evening dances and during official EAST hours both weekends. See the full band lineup below (updates at www.art84.org/events ). The Dance + Music + Art theme celebrates Austin’s truly unique live music and social dance scene in a comfortable home setting full of wonderful Austin art. Gentlemen Dancers: Ben Ruggiero, Ben Lynch, Ryan Vaughn. Art 84 (www.art84.org) operates under Fisterra Projects, a 501(c)(3) non-profit, Jennifer Chenoweth, Executive Director. Led by Larry Vanston, Art 84 promotes the idea that everyone should collect original art to make Austin the original art capital of the world. Art 84 also explores the integration of dance, music, and the visual arts, as well as the linkage between technology and art. Fisterra Projects utilizes art to inspire and revitalize people and communities. As a cultural partner for creativity and engagement, it collaborates with experts, community organizations and individuals with art as a framework for activation. Art can inspire people to greater trust, satisfaction, and prosperity through connectedness to their community, place, and purpose. This project is sponsored in part by the Cultural Arts Division of the City of Austin Economic Development Department. Art 84 is also sponsored in part by Austin-based Technology Futures, Inc and Tito’s Handmade Vodka. Additional events during EAST hours. See www.art84.org for updates. Wilkinsburg, PA is memorable for the many historic buildings within a small area. 21 of those historic buildings are churches. For the final event of the community art project, “Come Over, Come Eat, Come Play”, artist Jennifer Chenoweth will produce a tour of these buildings with arts and music programming at each location. As the date gets closer, we will have a schedule of programming and a map of each stop. There will be a bus that transports people between stops on a route between 11a-6p. We want to celebrate what is sacred between us within this community. The space between us is sacred. 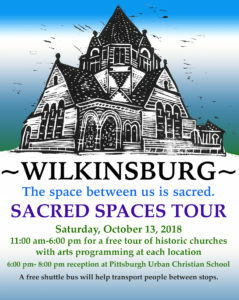 Look forward to food, art, music and beautiful buildings at multiple stops in Wilkinsburg. “Come Over, Come Eat, Come Play” by Jennifer Chenoweth in collaboration with the Wilkinsburg Community Development Corporation and the Wilkinsburg Community Art and Civic Design Commission with sponsorship by the Temporary Public Art and Placemaking Program of Neighborhood Allies and theOffice of Public Art of Pittsburgh. We are grateful for the generous support of the Heinz Foundation and Hillman Family Foundation. In November 2003, 28 artists opened their homes and studios for the first East Austin Studio Tour. The orange house on the corner of east 2nd Street at Waller, with its backyard studio, became a spot that thousands of visitors have returned to each year. A new group of guest artists created exhibits of their art in each room of the house, while the home cooked posole and hospitality of Jennifer Chenoweth’s house remained a staple. November 2017 was the last year for Fisterra Studio to participate in EAST in this space, but the annual event had a deep effect on Austin’s sense of community and connectedness. 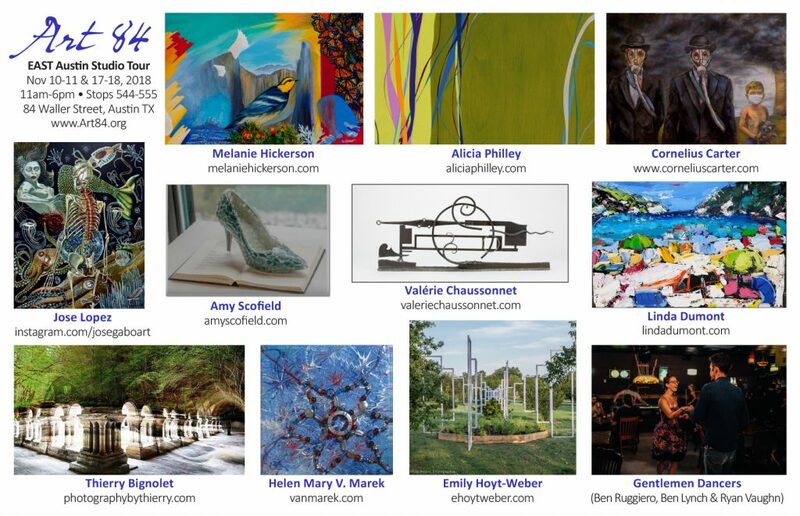 This show invites the 64 guest artists to collaborate again to inspire artists and art lovers about the beauty, quality and diversity of visual art in Austin. 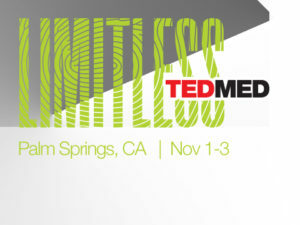 Honored, humbled, delighted and excited to be invited to speak about the XYZ Atlas at TEDMED in Palm Springs, California November 2017. The GO collaborative team, Fisterra Studio, Public City, Austin Creative Alliance, and the City of Austin, is proud to announce Drawing Lines, an ArtPlace funded project. Historically, Austin has had an at-large representation on its city council. However, in November 2014 the city will transition to a system where council members represent specific districts. This new political landscape presents many opportunities and challenges to the city as well as its citizens. This is where Drawing Lines comes in. 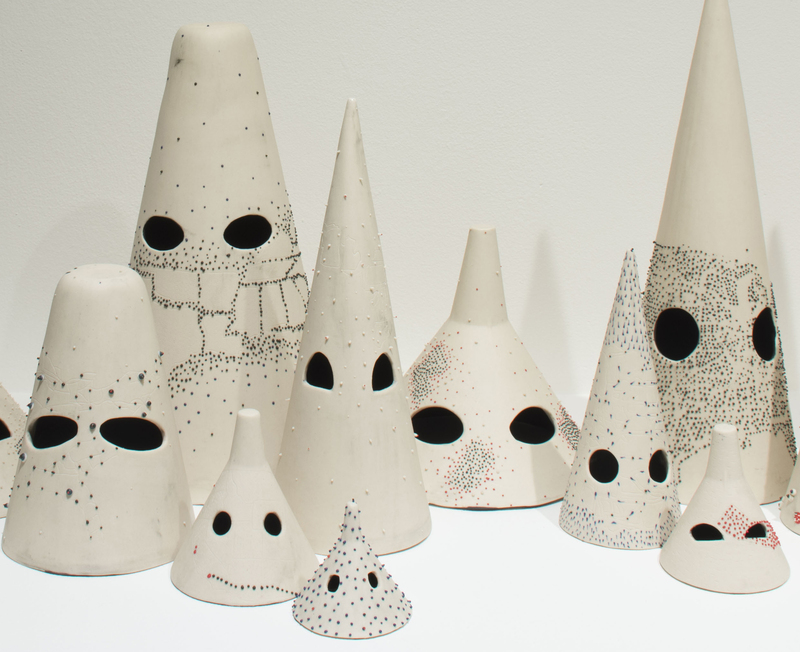 Through this project, Fisterra Studio will collaborate with ten artists working within each district to create a work that expresses a collective understanding of Austin’s diverse communities. The project will run from Fall 2014 – Fall 2015, culminating in public exhibitions. Artists’ projects and the City of Austin’s GIS-based cultural asset maps will be featured. Thank you ArtPlace for this amazing opportunity to participate in documenting change through art.